Heat oven to 350°F. Unroll 1 pie crust in ungreased 9-inch pie plate. Press firmly against side and bottom. In food processor, crumble almond paste; add almonds and 1/4 cup granulated sugar. Cover; process 1 minute. Spread in crust-lined pie plate. Top with second crust; press down. Crimp edges together. Prick crust several times with fork. Bake about 30 minutes or until golden brown. In 2-quart saucepan, mix 1 1/2 cups granulated sugar, the cornstarch and salt with wire whisk. Beat in cold water and lemon juice. Add egg yolks; beat until smooth. Add butter; gradually stir in boiling water. Heat to boiling over medium heat, stirring constantly. Boil 2 minutes. Remove from heat; add lemon extract, lemon peel and food color. Cover surface with plastic wrap. Cool 30 minutes. Pour into pie plate. Refrigerate 30 minutes. Meanwhile, in small bowl, beat 1 cup powdered sugar and the cream cheese with electric mixer on medium speed until smooth. Beat in milk until well blended. Add pudding; beat 2 minutes longer or until thickened. Pour into pie plate. In medium bowl, beat garnish ingredients with electric mixer on high speed about 2 minutes or until stiff peaks form. Place mixture in decorating bag fitted with star tip. Decorate top of pie as desired. Cover and refrigerate any remaining pie. 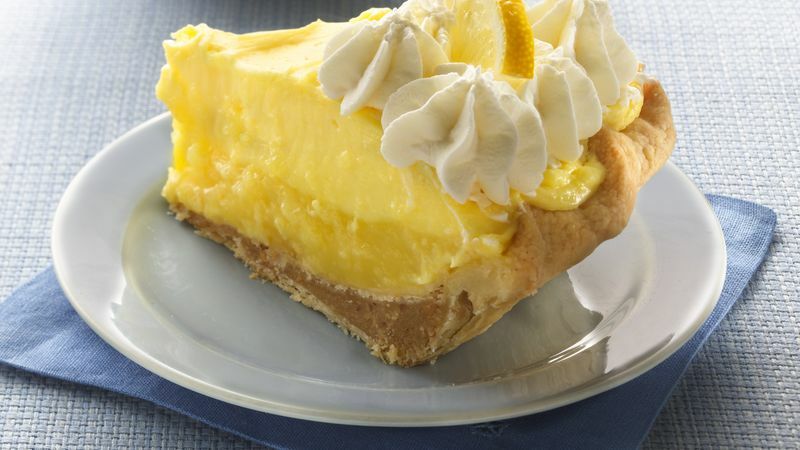 Garnish with a quartered lemon slice atop the whipped cream layer. This was a winning pie from the Pillsbury® Refrigerated Pie Crust Championship in 2007. This recipe was submitted by Whitney Haynes of Middleton, first place winner of the Topsfield Fair (MA).